Up to now, when you wanted something to happen at a specific time interval with the Arduino, you used delay(). When the Arduino calls delay(), it freezes its current state for the duration of the delay. That means there can be no other input or output while it’s waiting. Delays are also not very helpful for keeping track of time. If you wanted to do something every 10 seconds, having a 10 second delay would be fairly cumbersome. The millis() function helps to solve these problems. 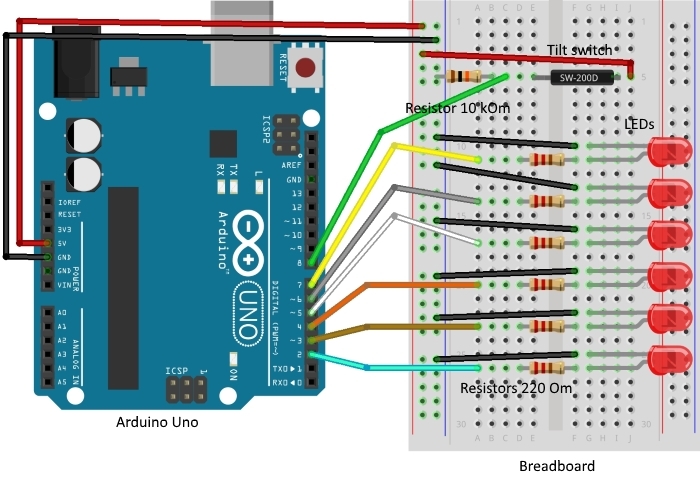 It keeps track of the time your Arduino has been running in milliseconds. You used it previously in Arduino Starter Kit Project 6 when you created a timer for calibration. So far you’ve been declaring variables as int. An int (integer) is a 16-bit number, it holds values between -32,768 and 32,767. Those may be some large numbers, but if the Arduino is counting 1000 times a second with millis(), you run out of space in less than a minute. The long datatype holds a 32-bit number (between -2,147,483,648 and 2,147,483,647). Since you can’t run time backwards to get negative numbers, the variable to store millis() time is called an unsigned long. When a datatype is called unsigned, it is only positive. This allows you to count even higher. An unsigned long can count up to 4,294,967,295. That’s enough space for milis() to store time for almost 50 days. By comparing the current millis() to a specific value, you can see if a certain amount of time has passed. When you turn your hourglass over, a tilt switch will change its state, and that will set oﬀ another cycle of LEDs turning on. The tilt switch works just like a regular switch in that it is an on/oﬀ sensor. You’ll use it here as a digital input. What makes tilt switches unique is that they detect orientation. Typically they have a small cavity inside the housing that has a metal ball. 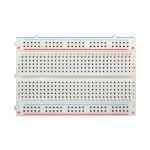 When tilted in the proper way, the ball rolls to one side of the cavity and connects the two leads that are in your breadboard, closing the switch. With six LEDs, your hourglass will run for an hour, just as its name implies. Connect power and ground to your breadboard. 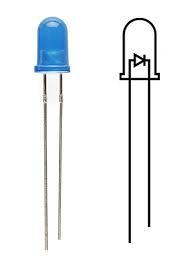 Connect the anode (longer leg) of six LEDs to digital pins 2-7. 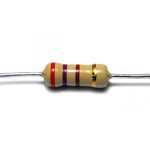 Connect the LEDs to ground through 220-ohm resistors. Connect one lead of the tilt switch to 5V. Connect the other to a 10-kilohm resistor to ground. Connect the junction where they meet to digital pin 8. 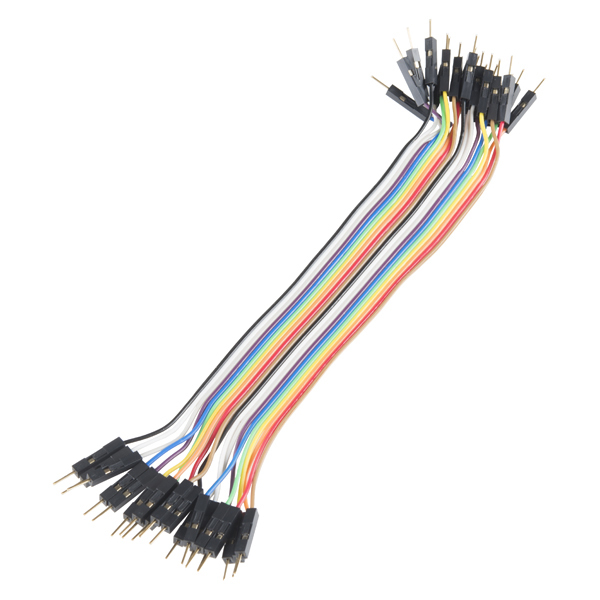 You don’t need to have your Arduino tethered to the computer for this to work. Try building a stand with some cardboard or styrofoam and power the Arduino with a battery to make a portable version. You can create a cover with some numeric indicators alongside the lights. Tilt switches are great, inexpensive tools for determining the orientation of something. 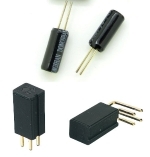 Accelerometers are another type of tilt sensor, but they give out much more information. They are also significantly more expensive. If you’re just looking to see if something is up or down, a tilt sensor works great. You need a number of global variables in your sketch to get everything working. To start, create a constant named switchPin. This will be the name of the pin your tilt switch is on. Create a variable of type unsigned long, This will hold the time an LED was last changed. Create a variable for the switch state, and another to hold the previous switch state. You use these two to compare the switch’s position from one loop to the next. Create a variable named led. This will be used to count which LED is the next one to be turned on. Start out with pin 2. The last variable you’re creating is the interval between each LED turning on. This will be a long datatype. In 10 minutes (the time between each LED turning on) 600,000 milliseconds pass. If you want the delay between lights to be longer or shorter, this is the number you change. 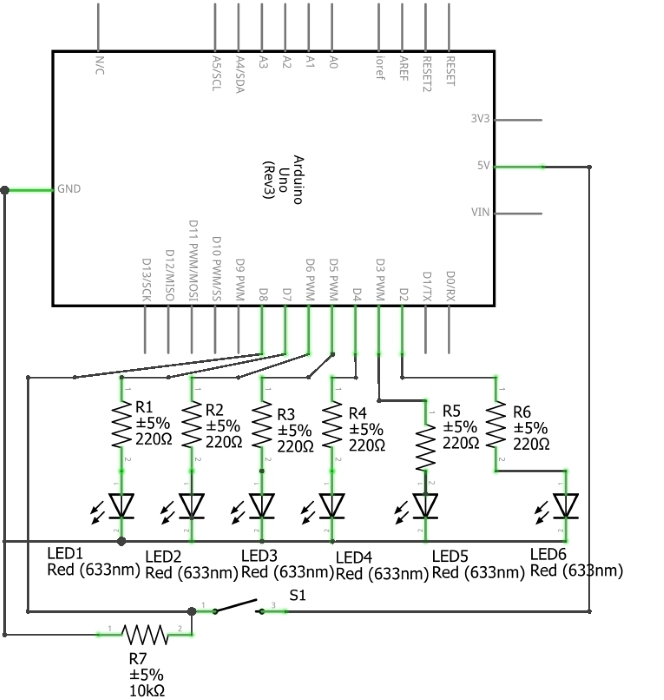 In your setup(), you need to declare the LED pins 2-7 as outputs. A for() loop declares all six as OUTPUT with just 3 lines of code. You also need to declare switchPin as an INPUT. 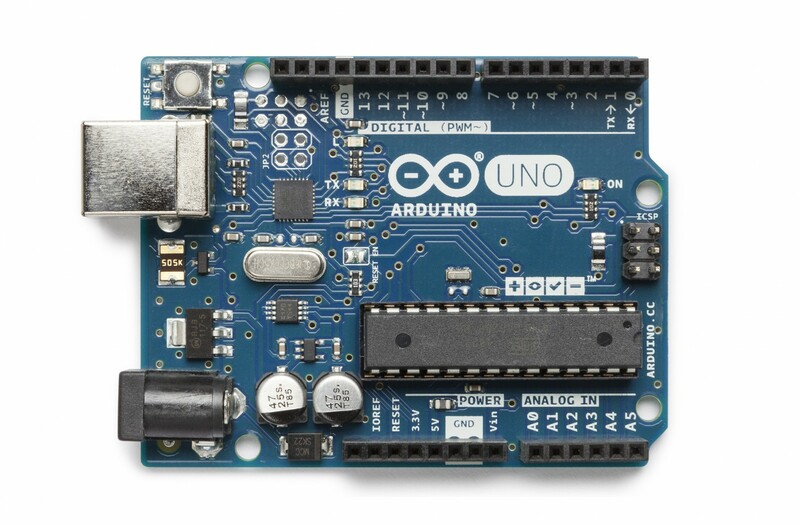 When the loop() starts, you’re going to get the amount of time the Arduino has been running with millis() and store it in a local variable named currentTime. Using an if() statement, you check if enough time has passed to turn on an LED. Subtract the currentTime from the previousTime and check to see if it is greater than the interval variable. If 600,000 milliseconds have passed (10 minutes), you set the variable previousTime to the value of currentTime. previousTime indicates the last time an LED was turned on. Once you set previousTime, turn on the LED, and increment the led variable. The next time you pass the time interval, the next LED will light up. Add one more if statement in the program to check if the LED on pin 7 is turned on. Don’t do anything with this yet. You decide what happens at the end of the hour later. Now that you checked the time, you want to see if the switch has changed its state. Read the switch value into the switchState variable. With an if() statement, check to see if the switch is in a diﬀerent position than it was previously. The != evaluation checks to see if switchState does not equal prevSwitchState. If they are diﬀerent, turn the LEDs oﬀ, return the led variable to the first pin, and reset the timer for the LEDs by setting previousTime to currentTime. At the end of the loop(), save the switch state in prevSwitchState, so you can compare it to the value you get for switchState in the next loop(). Once you programmed the board, check the time on a clock. After 10 minutes have passed, the first LED should have turned on. Every 10 minutes after that, a new light will turn on. At the end of an hour, all six light should be on. When you flip the circuit over, and cause the tilt switch to change its state, the lights will turn off and the timer will start again. When the clock reaches one hour and all six lights are on, they just stay on. Sound or ﬂashing the lights are both good indicators of a way to get your attention when the hour is up. The led variable can be checked to see if all the lights are on, that’s a good place to check for grabbing someone’s attention. Unlike an hourglass filled with sand, the lights go either up or down depending on the orientation of the switch. You can use the switchState variable to do so. To measure the amount of time between events, use the millis() function. Because the numbers it generates are larger than what you can store in an int, you should use the datatype unsigned long for storing its values.